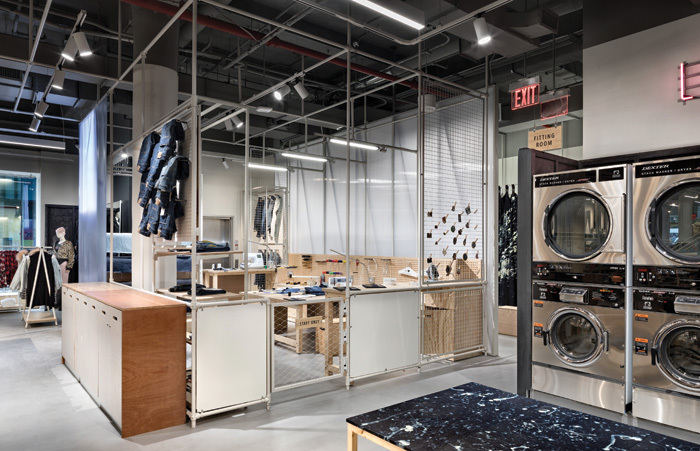 Clothing brand American Eagle has celebrated its 40th anniversary, marking the occasion with the opening of a new concept store in Manhattan’s vibrant Union Square, as designed by Checkland Kindleysides. Called the AE Studio, the store ‘goes beyond a standard transactional hub’, says Checkland Kindleysides, with experience-focused elements that elevate the in-store customer experience. 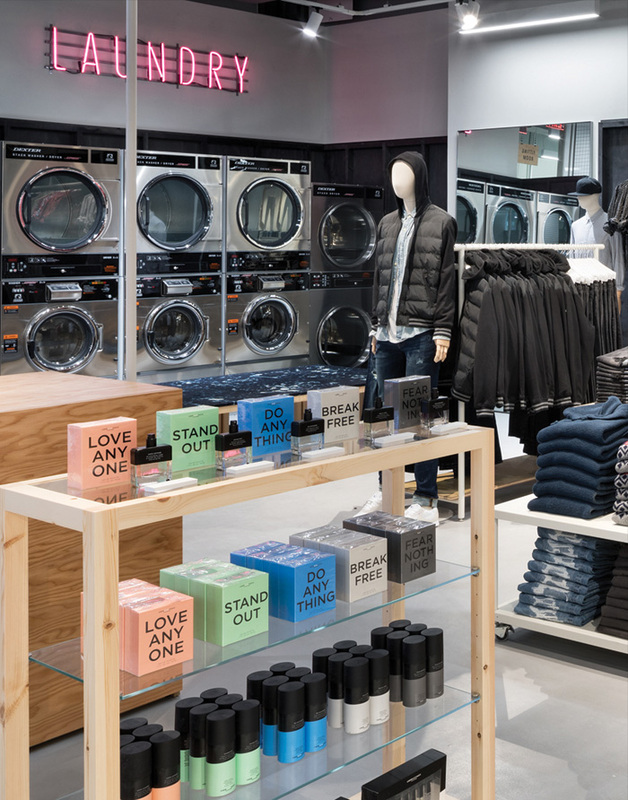 Its futuristic retail approach allows shoppers to create their own in-store experiences with the brand through the use of social media, clothing customisation or simply as a hang-out where they can do their laundry. Customers can browse American Eagles’ entire jeans collection and create one-of-a-kind pieces through a maker’s shop, which features options for customers to personalise their AE Jeans to fit their distinctive style. Within the gallery, jeans are presented like artist easels on canvas stretchers and iPads provide a deeper look into product fit and specifications. Moving upstairs, with bold graphics lining the staircase to communicate American Eagle’s ‘bold, creativity and the versatility of collections’, and the visitor is met with some interesting spaces, all designed to increase dwell time. First is the in-store workspace for the brand’s social media team, which allows them to create content in real-time and facilitates open communication between American Eagle and its customers. Next is the Lounge. This space allows customers (particularly students waiting for their laundry to finish) to hang out with friends, or even study, while enjoying the free WIFI and complimentary refreshments. Then there’s the inspirational Collaboration Space featuring capsule collections, displaying new brands and work from emerging designers and artists. The whole scheme has given careful consideration to a 21st-century retail experience for a largely Millennial generation, which sees personalised reinforcement favoured over personal assistance. Both floors feature generous fitting rooms, where inspirational style edits are displayed on peg panels outside curtained cubicles, with further peg boards inside for customers to create their own looks. As well as providing effective selling spaces, they also lend the brand to a little social media PR thanks to some Instagram posts from the nearby iPads. Visually, the store reflects a work-in-progress attitude of American Eagle’s core customer with a pared-back interior that blends functional and improvised materials.